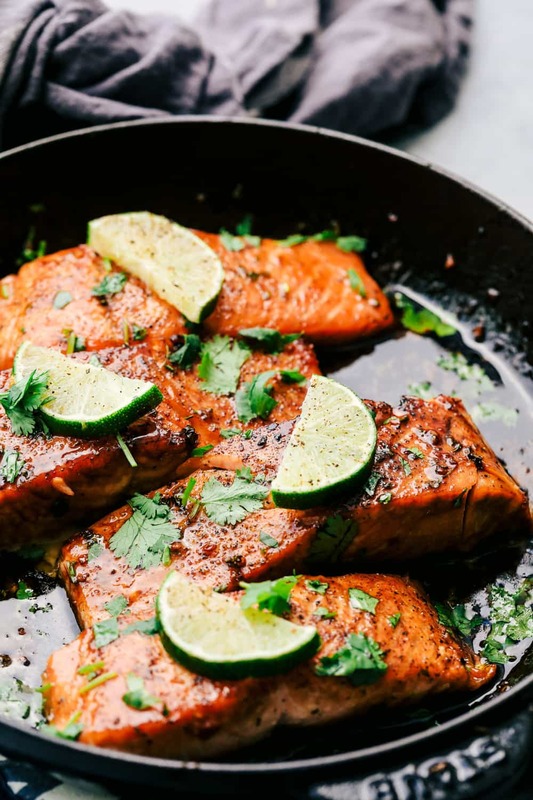 Cilantro Lime Butter Salmon is pan seared to tender and flaky perfection and has the most amazing cilantro lime butter honey sauce on top! For more cilantro lime recipes be sure to make: Cilantro Lime Shrimp Lettuce Wraps, Grilled Honey Lime Cilantro Chicken, or try Slow Cooker Creamy Cilantro Lime Chicken. You know my love for salmon. And you would think that I would be getting sick of it by now, but nope! 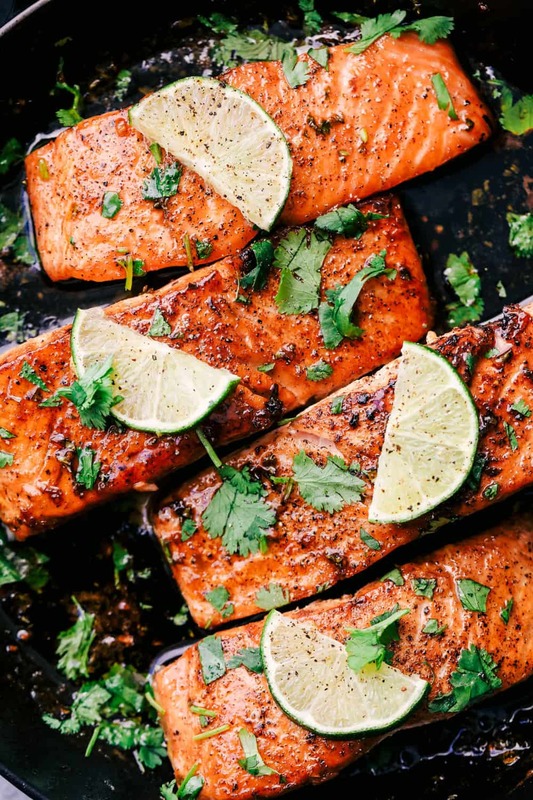 Salmon has been a huge part of my 40 pound baby weight loss. And I finally hit my goal! Never in a million years did I think I would be able to lose this last weight from the baby, but it feels SO amazing to be here. I LOVE FOOD!! I have definitely learned that I can still eat the foods that I love, I just have to listen to my body and when to stop eating. I lost it just in time for summer and I actually don’t have to be terrified of getting into a swimsuit. I have to keep my favorite salmon recipes on rotation and coming up with new flavor combinations is my favorite. Cilantro lime is such a wonderful flavor combination and one that my family all loves as well. This salmon came out absolutely perfect! In a large non stick skillet over medium-high heat add 2 Tablespoons of oil. Salt and pepper salmon and place skin side up and reduce heat to medium low. Let cook without flipping for 6-7 minutes until the salmon has a nicely brown edge. Flip the salmon over and cook for an additional 2 minutes. How do you make the cilantro lime butter sauce? Add butter to your skillet and wait to melt. Add garlic and cook for a minute. Whisk in vegetable broth, lime juice, honey, and cilantro. Let the sauce simmer and reduce and add salmon back to the pan. Top with extra chopped cilantro and fresh limes. The flavor is fantastic in this meal! I love recipes that are healthy and have such great flavor. 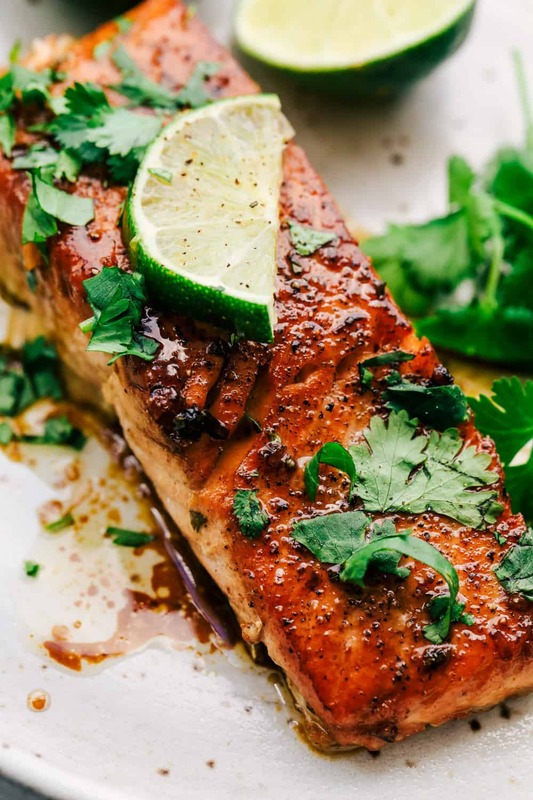 Making salmon is so quick and easy and I know this is a dish that everyone will love! That sauce sounds amazing. Yum! I cannot wait to try. 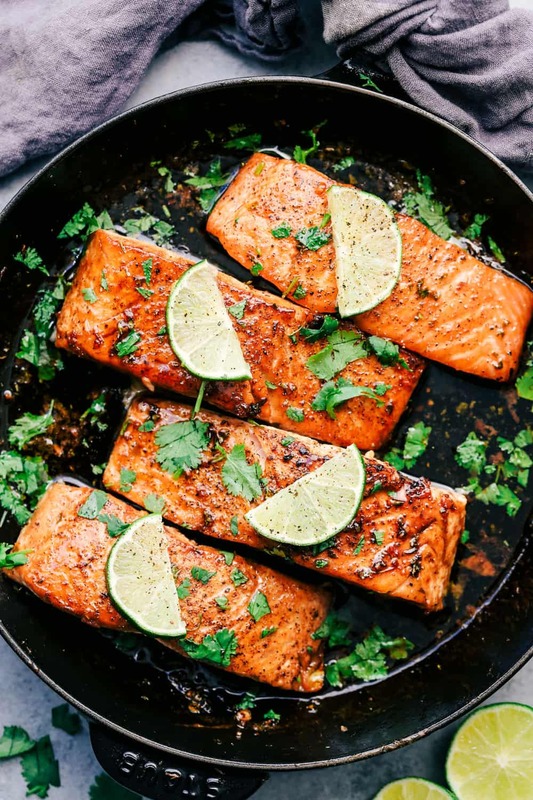 I’ve made several of your salmon recipes and they have been a hit! I’m loving your blog, great recipes, explained very well & your videos are wonderful. So glad I found you! Look forward to all your posts & trying your recipes. Thank you !! 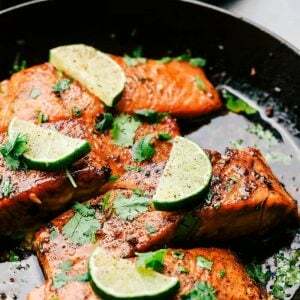 I am making your lime butter cilantro salmon tonight. It looks so delicious. But as I was drawn into many of your other recipes they all look so mouthwatering I want to have them all tonight. We will soon anyway. BTW, my husband and I both think you are hot. Oh yeah, and I am a heterosexual woman and he is totally hetero. I hope this isn’t offensive to you or anyone. Made this, this evening and it was a hit! I was worried it would be too sweet, but the sauce was fantastic!